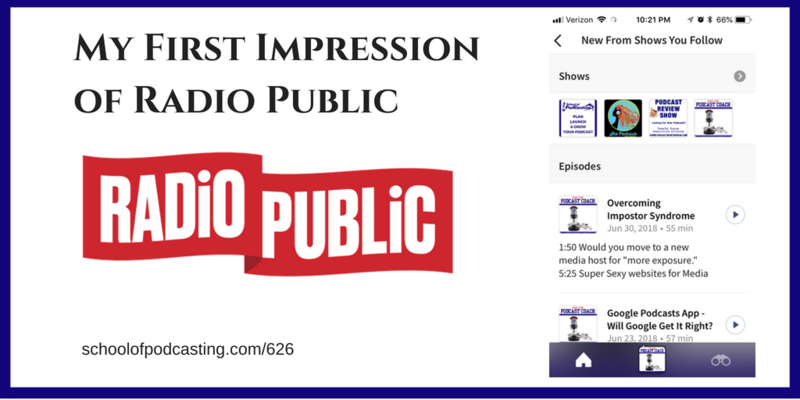 My First Impression of Radio Public Can You Get Your Audience to Switch Apps? You can get your podcast on the Radio Public platform at https://podcasters.radiopublic.com/. Once you’ve been approved at Radio Public, they send a weekly email summary to your email with details about your Paid Listens activity on RadioPublic. Once your podcast earns $25 it will be eligible for payout, and we’ll send an email with information about how to configure the payment step. Earnings are a combination of your Paid Listens (at a rate of $20 per 1000 listens of your episodes in the RadioPublic app) and for every new listener that hears three episodes of your show in the RadioPublic app, you’ll earn a Loyal Listener bonus of an additional (one-time) $1 – and yes, this bonus layers on top of your Paid Listens rate. Privacy: RadioPublic doesn’t require a login, so you can start listening right away, and your privacy is always respected. Open platform: While some podcast listening apps take a “walled garden” approach, RadioPublic is open to all podcasts. Rewarding podcasters: not only do episodes heard in the RadioPublic apps earn money for podcasters through the Paid Listens rate and the Loyal Listener bonus, we're developing a healthy ecosystem and building a marketplace to support the long-term business models of all podcasters big and small. By listening with RadioPublic, your show can stay financially sustainable so you can keep making episodes. Public benefit: RadioPublic is a Public Benefit Corporation powered by bona fide podcast geeks with extensive experience in public and not-for-profit media. What Is the Criteria For a Listen? We define a Paid Listen as a listener hearing at least 60% or 30 minutes of an episode, whichever is shorter. For now, only listens in the native RadioPublic mobile apps for iOS and Android count. Multiple listens to a given episode by the same user’s device/account will count as a single listen. Also, it is important to understand that a download does not necessarily equal a listen. On all podcast apps, including RadioPublic, a given episode's audio file might be downloaded multiple times: the user could have deleted it before listening; a user’s local network error can occur and the file needs to be downloaded again; a podcast hosting provider can have an issue that initiates another download, etc.RadioPublic measures when an episode is actually heard, so you should not always expect a 1:1 download to listen ratio in your hosting provider’s metrics or dashboard. What to Do If Your Episode Already Has Ads? It depends. Are your ads a part of your final audio file (usually called “baked in,” these ads are permanent fixtures and considered a part of the overall episode forever), or are your ads dynamically inserted (ads can be added in, removed, or updated over time and operate independently of your episode)? 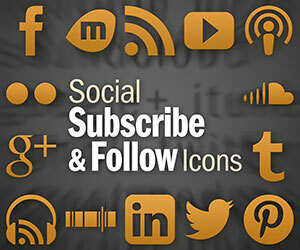 Create another RSS feed that contains ad-free episodes and provide that feed to RadioPublic. Contact your ad sales team and podcast hosting company, as they may have the ability to turn off dynamically inserted ads when episodes are requested from RadioPublic. While your show’s RadioPublic link is quite possibly the most powerful podcaster tool at your disposal, your individual episode links are a definite close second (and third, fourth, fifth… keep on counting until you get to the number of episodes you’ve published). Each episode is an opportunity for someone to get hooked on your show, and individual episode pages serve both as gateways for new listeners and regular reminders for your returning ones. Where Do The Ads Go? RadioPublic will place audio ads before and/or after episodes participating in Paid Listens, and the ads will be clearly demarcated with audio and visual cues as distinct from your show, not part of it. I looked at my stats for the School of Podcasting and I'm getting around 20,000 downloads a month (again, I have over 600 episodes) so at $20 for one thousand downloads that is 20 X 20 or $400 a month. There is only one slight problem. I would need every single person to subscribe on Radio Public, and the listens on my website via their embed-able player don't count. So I am testing the waters to see what happens. John Bukenas of www.audioeditingsolutions.com on the www.hatetoweight.com show that he tried to import his shows, and the app crashed. Last month on Ask the Podcast Coach I had 3, 852 downloads. If we play in fantasy land and says EVERYBODY heard it on Radio Public, I would make $76. What I do on that show is I do an extra 30 minutes of show with my co-host Jim Collison from www.theaverageguy.tv and put it behind a paywall using Patreon. Last month I'm made $398 (as someone took the option to pay $125/month and receive an hour of one on one coaching) if we removed that (as that slot is not always full that would be $248. (or 3.2 times the amount of money from Radio Public). With the short time I tested Radio Public, they need to be able to group podcasts together. I would get to the $25 a month payout fee if all my shows were listed under one account. From what I've seen they are not. So now every show would have to get 1250 downloads (the amount you need to make $25) instead of all of my shows working together. That would make for more payouts, and make it worth my while. 8. Don't own my content, control my links, or block my access to distribution or stats (like Anchor). Pippa Launched in October of 2017. With a goal of making it easy to start a podcast, and making it easy to monetize. They have done some questionable marketing (by scraping email addresses from the iTunes Database and accusing their competition of inflating their numbers). I've tested their service with The History of Six Shooter podcast. Their interface is simple, and they do offer free transcriptions. I tested their transcription service and it was only 70% accurate (so plan on spending a fair amount of time tweaking your transcription). Originally they adopted the Soundcloud business plan which enables unlimited uploads and unlimited downloads (And lost 100 million dollars). Recently they updated their pricing. They STILL allow you to upload as many files as you want, but they limit the size of your audience (the more expensive the package, the more downloads you are allowed). 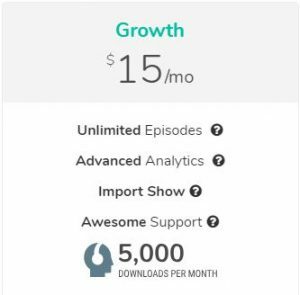 For this show that gets over 20,000 downloads a month, I would be on the $50 a month plan. I currently use the $20/month plan at Libsyn.com (use the coupon code sopfree for a free month). 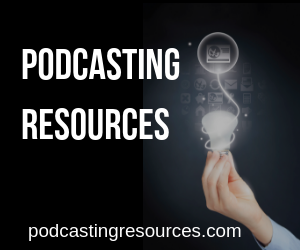 Ready to Plan, Launch or Grow Your Podcast?